Can a dish this simple, this rich in Omega-3s, this absolutely good-for-you, actually taste great? You bet! I’m inspired by the Mustard Museum in Mt. Horeb, Wisconsin, and its 4000 mustard collection: those people love! mustard. Rinse salmon in cold water, pat dry with paper towels. Place salmon on a shallow plate; top with soy sauce, turning to coat. Let stand 10 minutes. Combine wine, lemon juice, mustard and oil; set aside. Heat a large nonstick skillet over medium-high heat until hot. Add salmon; cook 3 minutes. Turn salmon gently; pour mustard mixture evenly over salmon. Reduce heat to low immediately; continue cooking until salmon is firm to the touch, 1 to 2 minutes. With a slotted spatula, transfer salmon to four serving plates; keep warm. Pour any mustard sauce from plates back into skillet. Increase heat to high. Add spinach to skillet (in two batches if necessary); cook until wilted, turning the spinach with tongs—about 1 minute. 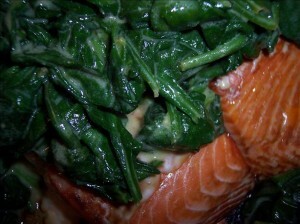 Spoon spinach and sauce over salmon. Garnish with lemon peel if desired. When you buy a salmon filet, ask your grocer to skin it for you. If this is inconvenient, keep the skin on. Remove the skin by sliding a knife between the salmon skin and salmon filet. Though this takes some practice, you also remove the fishiness of the salmon when you remove the skin. Any dry white wine will work here, as will reduced sodium soy sauce.